Space telescope Hubble and its successor, the James Webb Space Telescope are made with huge, expensive mirrors. And that can be a problem when you’re paying to launch the thing into space. So instead of one big mirror, how about thousands, or even millions, of tiny ones? In other words, how about glitter? Orbiting Rainbows is in fact a very real system being considered by NASA’s Jet Propulsion Laboratory. A telescope reflecting light with glitter clouds could potentially be a lot cheaper than the $8.7 billion James Webb Space Telescope. In the proposed Orbiting Rainbows system, the small cloud of glitter-like grains would be trapped and manipulated with multiple laser beams. The trapping happens because of pressure from the laser light — specifically, the momentum of photons translates into two forces: one that pushes particles away, and another that pushes the particles toward the axis of the light beam. The pressure of the laser light coming from different directions shapes the cloud and pushes the small grains to align in the same direction. In a space telescope, the tenuous cloud would be formed by millions of grains, each possibly as small as fractions of a millimeter in diameter. But the initial set-ups testing Orbiting Rainbows are pretty low-tech. 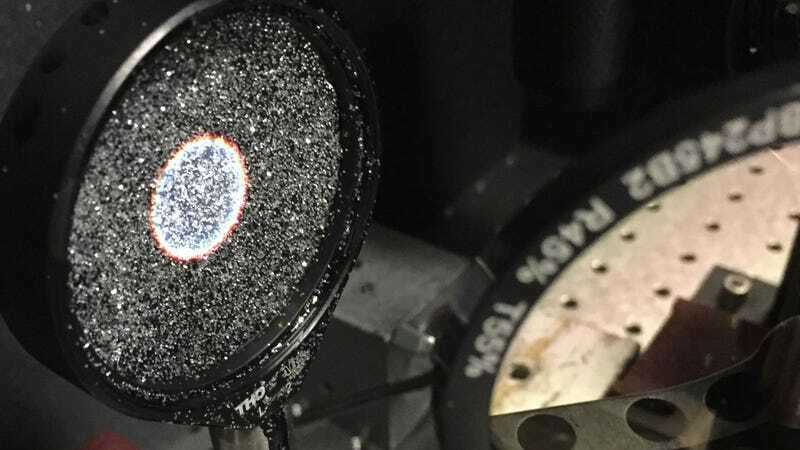 Co-investigator Grover Swartzlander at the Rochester Institute of Technology and his team spread glitter on a lens, shined lasers simulating the light of a double star system, and algorithmically reconstructed the twin stars out of the glitter reflection. The last step is really the key. Images reflected off of glitter will always be distorted, so scientists will need a lot of computational power to figure out what they’re supposed to see. Orbiting Rainbows does away with the challenge of manufacturing a huge mirror, but it creates a whole new computational challenge. For now, scientists are still tinkering with the idea on Earth. But Orbiting Rainbows could one day live up to its name and, well, make it out into orbit.